:Reading Scripture can raise difficult questions for us. Exploring our faith through these questions can deepen our trust in and strengthen our relationship with God. But where do we go for answers?Searching for Answers is not designed to give pat answers to complex questions. Instead, this study will help believers think through the issues with which they may be struggling. It will provide ways for the church to talk openly and honestly about questions of faith.Chapter 1: Why Does God Allow Suffering?Chapter 2: What Should a Christian Believe About Creation?Chapter 3: How Do We Reconcile the Violence of the Old Testament with the Call to be Peacemakers in the New Testament?Chapter 4: Is the Bible Trustworthy?Chapter 5: How Do We Know God? 's WillChapter 6: Is Christianity the Only True Religion/Is Christ the Only Way?Chapter 7: Why Don't We See More Miraculous Signs in the Church Today?The DIALOG SERIES offers Bible-based, life related studies for small groups, Sunday school classes, or personal discoveries. Each 7-week study is written by qualified and thought-provoking Christian thinkers to promote community and growth in Christ. 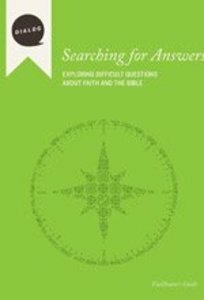 About "Searching For Answers (Facilitator's Guide) (Dialog Study Series)"
Mike Wonch is the senior editor for the adult curriculum group at WordAction. A native of North Platte, Nebraska, Mike is a graduate of MidAmerica Nazarene University and Nazarene Theological Seminary. He has served as a youth pastor, admissions counselor, and curriculum and book editor for Nazarene Publishing House.